Since its foundation in 1949, ASABA MANUFACTURING, INC. has been exploring the applications of mist related technologies in agriculture and other fields. 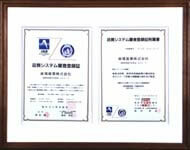 The first goal of our company was to help increase Japan’s agricultural production in the difficult postwar years. Paying particular attention to nozzles and piping systems, our research and development focused on the efficient commercial production of safe and reliable agricultural mist sprayers. Since that time, ASABA has become a world leader in the field, due to our advanced technology and development of state-of-the-art mist controlling nozzles. We have based our growth on research and technology, and our ability to respond quickly to the needs of the market. In 1998, we commenced overseas production at our factory in the Philippines. At this factory, resin injection molding, aluminum and zinc die-casting molding and mold maintenance are performed. An assembly line has been installed at a new factory, blow molding is also being done now. Through further increases in our in-house manufacture of parts and components,and greater cost reductions, we aim to have ASABA brand as widely accepted throughout the world as it is in Japan. In the 21st century, ASABA will use its entrepreneurial spirit to further develop its technology, and continue to manufacture the highest quality products in the field. Copyright © 2019 ASABA MANUFACTURING, INC. All Rights Reserved.